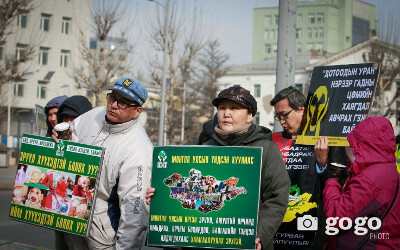 AKIPRESS.COM - More than 30 residents of Ulaanbaatar gathered today at Chinggis Square to protest against Mongolia's joining the 1997 Joint Convention on the Safety of Spent Fuel Management and on the Safety of Radioactive Waste Management. The State Great Khural was expected to consider the procedures during its irregular plenary session. The protesters brought yellow powder with them. They poured the thing on the ground, what police considered as uranium. They detained the protesters in this regard. The Emergency Management Agency is investigating whether the powder was uranium or not. The Joint Convention on the Safety of Spent Fuel Management and on the Safety of Radioactive Waste Management was adopted on in 1997 by 84 states. According to Article 12, countries that have joined the Convention must accept a ban on importing the spent fuel and radioactive waste used by other countries.